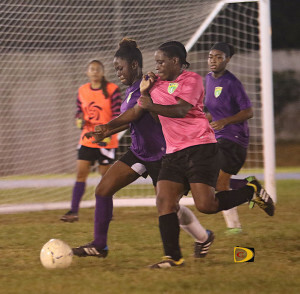 Ball Starz advanced to face Virgin Gorda United in the BVI Football Association Women’s Football League Championships game, after beating the Avengers 2-1 on Sunday night. The loss left Avengers coach Gloria George puzzled. In Men’s play, the unbaten Islanders completed an eventful weekend with a battling 3-1 victory over One Love. Julian Davidson (3rd) and Fitzroy Daley (15th) settled any nerves early on and gave the Islanders a 2-0 lead, before Richard Morgan (31st) pulled one back for One Love. At 2-1 going into the second half it was anyone’s game and the teams traded attacking until Kevin Fisher (89th) secured another 3 points for the Islanders, who remain atop the standings, unbeaten this season and with 24 points. The Sugar Boys are tucked into second place, just 3 points adrift. The Rebels and the Wolues are nestled into third and fourth and the pair were equally deadlocked after a six-goal thriller on Saturday. Kevin Carragher (7th) put the Wolues ahead early, but Curtly Peters (16th) levelled the game, before Deangelo Thomas (29th) gave the Rebels a 2-1 lead. However, Carragher scored his second from the penalty spot right on half time, to make it 2-2. Timothy Parsons (63rd) gave the Wolues a 3-2 lead, but Peters (72nd) made it 3-3 and despite a thrilling last ten minutes neither team would score again. At the other end of the table, Old Madrid secured their 5th place position and gave themselves a chance of a top four finish with a 3-0 second half demolition of winless Virgin Gorda United. Kenmore Peters netted twice (48th and 62nd) whilst Vaughn Homer(53rd) had doubled the Old Madrid lead.